Try using a corer or a paring knife and a small melon baller or the tip of a vegetable peeler to remove the core. Try fresh cranberries, raisins or other dry fruit in the center. For additional servings, increase the cooking time about 1 minute for each apple. Serve for breakfast or dessert! Wash apple and remove core (seed area), leaving the bottom to hold in the filling. Peel a small band of skin from around the top of the apple. Place the apple in a microwave safe container. 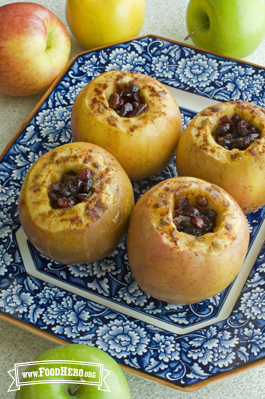 Sprinkle cinnamon around the top of the apple and into the hole. Fill the center of the apple with cranberries, pressing down if needed. Top the cranberries with the brown sugar and margarine. Cover loosely with wax paper. Microwave on high for about 2 1/2 minutes or until apple is soft when poked through the center hole with a fork. Cool slightly.